How about those Baylor Bears??? We watched a pretty amazing game last night that only solidified that RGIII was the correct pick for the Heisman trophy this year! I have another pie to share with you today! 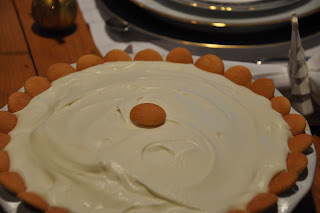 Family and friends loved this Banana Pudding Pie and the presentation looks almost as good as it tastes! I hope you have a fabulous New Years Eve! In a medium bowl, stir together crushed vanilla wafers and butter until blended. Firmly press on bottom and up the sides of a 9-inch pie plate. 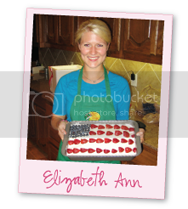 Bake at 350° for 10 to 12 minutes or until lightly browned. Remove to a wire rack, and let cool 30 minutes or until completely cool. NOTE: It's best to prepare the pudding in advance to allow it to chill properly. There is a restuarant in my hometown who has a dessert similar to this! And I love it! Thanks for sharing this recipe! Enjoy your last few days of 2011! Happy New Year! mouth is watering! pretty sure i'm making this tonight! oh my must try this pie! even though i don't like bananas very much i can much appreciate the pie version :-) happy new years friend! Yummy! I can't wait to give this pie a try. It sounds wonderful and is sure to be a hit with the family. This sounds AMAZING. Do you think you could mix the vanilla pudding and bananas to make banana pudding? I've never done it. But banana pudding is seriously my favorite dessert, and my recipe involves banana pudding, bananas, whipped cream, and vanilla wafers. But in pie form! Delish! Can't wait to try!!! That looks so yummy. I can start my new years resolution tomorrow right?